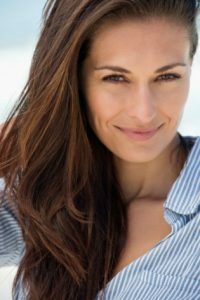 The short scar or limited incision facelift is an innovative technique that achieves the same result as a full facelift but with much less visible scarring. Normally, the scars of a facelift extend behind the ear into the hairline. With new advances in plastic surgery, a short scar technique has been developed that greatly decreases the length of the scar. Using this technique, Dr. Lista, Dr. Ahmad or Dr. Austin creates a very small incision just above and below the front of the ear. There is no scar directly in front of the ear; instead, the scar is placed inside the ear. This new technique also eliminates the hairline scar behind the ear—a significant improvement that enables women to wear their hair up in a bun or pony tail without any tell-tale signs of surgery. This new procedure, as developed by Dr. Lista, has produced superb results for our Toronto and Mississauga facelift patients. The surgery for a short scar facelift takes less time and the recovery period is also much reduced vs. a regular facelift. Still, after a short scar facelift there will be some swelling and bruising that may last for a couple of weeks. Performing a short scar facelift procedure requires a skilled and experienced surgeon. At The Plastic Surgery Clinic we perform approximately 75 to 100 short scar facelift operations per year. Consequently, Dr. Lista, Dr. Ahmad and Dr. Austin are among the most experienced facelift surgeons in Ontario, Canada. Dr. Lista, Dr. Ahmad and Dr. Austin will listen carefully to your goals and help you determine whether a short scar facelift is the right procedure for your situation. The surgeons at The Plastic Surgery Clinic are proud to have helped hundreds of patients realize their dreams of a natural, relaxed, younger-looking face. Recognizing that many individuals feel apprehensive about undergoing a facelift, these surgeons conduct personal consultations, during which time they explain to you exactly how your facelift procedure is performed and what results it helps achieve. The personalized approach relieves anxiety and helps the surgeons deliver highly satisfying results for all of their Toronto cosmetic surgery patients. When considering a short scar facelift, we understand that cost can be a determining factor for most people. For this reason we offer free consults so that you can communicate your goals to one of our plastic surgeons, and we can give you an estimate based on your specifications. Many patients have been surprised at the price, and when they see the results they consider it to be an investment in their well being. Though most cosmetic surgery is not covered by insurance plans or provincial health plans, financing options offered through The Plastic Surgery Clinic make it possible for you to achieve what you want, sooner. To find out more about the cost of a short scar facelift, please contact us by phone or e-mail or by filling out the Request for Information form below.